For George Washington and the entire revolutionary generation, Cato was Liberty—the last man standing when Rome’s Republic fell. For centuries of philosophers and theologians, Cato was the Good Suicide—the most principled, most persuasive exception to the rule against self-slaughter. For Julius Caesar, the dictator who famously pardoned every opponent, Cato was the only man he could never forgive. George Washington and his peers studied Cato’s life in the form of the most popular play of that era: Cato: A Tragedy in Five Acts, by Joseph Addison. The great men of the day quoted this play about Cato in public statements and in private correspondence. When Benjamin Franklin opened his private diary, he was greeted with lines from the play that he had chosen as a motto. John and Abigail Adams quoted Cato to one another in their love letters. When Patrick Henry dared King George to give him liberty or death, he was cribbing from Cato. When Nathan Hale regretted that he had only one life to give for his country—seconds before the British army hanged him for high treason—he was poaching words straight from Cato. George Washington, John Adams, and Samuel Adams were all honored in their time as “the American Cato”—and in revolutionary America, there was little higher praise. And when Washington wrote to a pre-turncoat Benedict Arnold that “it is not in the power of any man to command success; but you have done more—you have deserved it,” he, too, lifted the words from Addison’s Cato. Through two millennia, Cato was mimicked, studied, despised, feared, revered. In his own day, he was a soldier and an aristocrat, a senator and a Stoic. The last in a family line of prominent statesmen, Cato spent a lifetime in the public eye as the standard-bearer of Rome’s optimates, traditionalists who saw themselves as the defenders of Rome’s ancient constitution, the preservers of the centuries-old system of government that propelled Rome’s growth from muddy city to mighty empire. Cato made a career out of purity, out of his refusal to give an inch in the face of pressure to compromise and deal. His was a powerful and lasting political type: the man who achieves and wields power by disdaining power, the politician above politics. It was an approach designed to elicit one of two things from his enemies: either total surrender or (in Cato’s eyes) a kind of moral capitulation. This strategy of all-or-nothing ended in crushing defeat. No one did more than Cato to rage against his Republic’s fall. Yet few did more, in the last accounting, to bring that fall to pass. History remembers Cato as Julius Caesar’s most formidable, infuriating enemy—at times the leader of the opposition, at times an opposition party unto himself, but always Caesar’s equal in eloquence, in conviction, and in force of character, a man equally capable of a full-volume dawn-to-dusk speech before Rome’s Senate and of a 30-day trek through North Africa’s sands, on foot. Cato’s name has faded in our time in a way that Caesar’s has not. Perhaps that is the cost of his political defeat; perhaps his virtues are out of style. More likely, he is forgotten because he left behind very little that was concrete. He reached the heights of Roman politics, but he didn’t pen epics celebrating his own accomplishments, as Cicero did. He was a brave, self-sacrificing, successful military commander, but he didn’t send home gripping third-person histories of his exploits, as Caesar did. His name was proverbial in his own time, but he didn’t engrave that name on monuments. He studied and practiced philosophy with focused intensity, turning himself into the model of the unflinching Stoic ideal, but he preferred that his philosophy be lived, not written. In fact, the only writing of Cato’s that survives is a single, short letter. Cato was certainly a self-promoter, but the only form of promotion he valued was example, the conspicuous conduct of his life—righteous in his friends’ eyes, self-righteous in his enemies’. Cato’s Rome teemed with imported wealth; Cato chose to wear the simple, outmoded clothing of Rome’s mythical founders and to go barefoot in sun and cold. Powerful men gifted themselves villas and vineyards; Cato preferred a life of monkish frugality. Roman politics was well-oiled with bribes, strategic marriages, and under-the-table favors; Cato’s vote famously had no price. These gestures were all, in their own way, a deliberate message to his fellow citizens, a warning that they had gone fatally soft. It is the kind of message that is remembered, but rarely heeded. Cato did not pen an autobiography, nor leave behind an extensive set of essays or journals. While Cato the Younger was an evergreen subject for a wide range of historians, biographers, and moralists in the Roman world, the most detailed classical treatment of his life comes from Plutarch. Plutarch was a Greek biographer, magistrate, and priest of Apollo, who took the Roman name Lucius Mestrius Plutarchus. He flourished during the reign of the Emperor Trajan and is best known today for his Parallel Lives of eminent Greeks and Romans, a collection that includes his life of Cato. For more than 2,000 years, there was no full-length biography of Cato outside of Plutarch’s work. In 2011, Jimmy Soni and Rob Goodman endeavored to write one. The result, Rome’s Last Citizen: The Life and Legacy of Cato, Mortal Enemy of Cesar, is the best volume, to date, that covers the end-to-end life of Cato. They were inspired by numerous book in which Cato is a central figure, including Rubicon by Tom Holland. If you have even a passing interest in the history of Rome—or you think you might—pick up Rubicon. It is gripping and thoughtful; you’ll never for a minute believe that you’re reading ancient history. Cato walked around ancient Rome in unusual clothing—with a goal of getting people to laugh at him. He learned to eat a poor man’s bread and live without luxuries—even though he was a Roman aristocrat. He would walk bareheaded in the rain, shoe-less in the cold. The Stoics taught Cato that there were no shades of gray. There was no more-or-less good, no more-or-less bad. Whether you were a foot underwater or a fathom, you were still drowning. All virtues were one and the same virtue, all vices the same vice. He demanded the same of his friends, his family, and his soldiers. He was infuriating to his enemies, and he could seem crazy to his allies. And yes, sometimes he took his adherence to principle down absurd, blind alleys. But he also built an impossible, almost inhuman standard that brought him unshakable authority. By default, he became Rome’s arbiter of right and wrong. When Cato spoke, people sat up straighter. When he was carted off to jail by Julius Caesar, the entire Senate joined him in sympathy, forcing Caesar to let Cato go. Many in Cato’s day spent their fortunes and slaughtered armies in pursuit of that kind of authority. But it can’t be bought or fought for—it’s the charisma of character. His countrymen couldn’t all be Catos, but they could join whichever uncompromising side of the argument Cato was on. On election day during a consequential race, Cato and his brother-in-law were ambushed while walking to the polls. 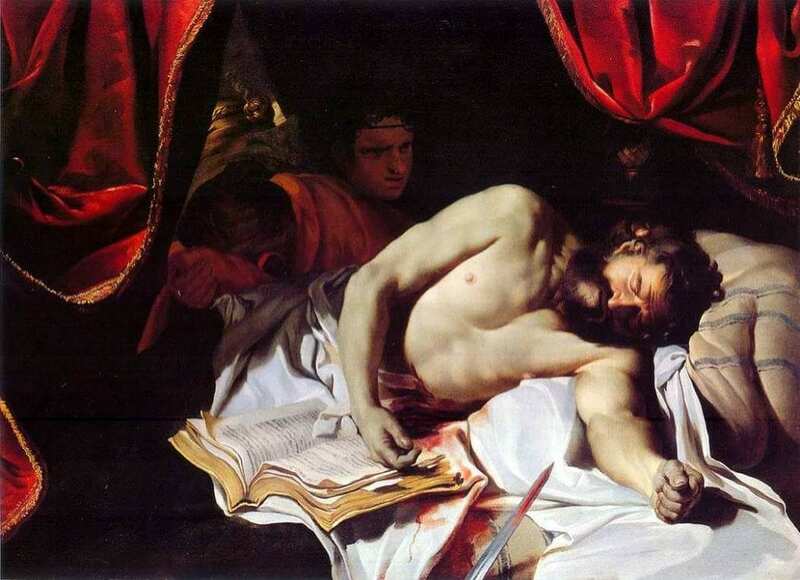 The torchbearer at the head of Cato’s party collapsed with a groan—stabbed to death. They were surrounded by shadows swinging swords. The assailants wounded each member of the party until all had fled but Cato and his brother-in-law. They held their ground, Cato gripping a wound that poured blood from his arm. For Cato, the ambush was a reminder that if the front-runners were willing to perpetrate such crimes on the way to power, then one could only imagine what they would do once they arrived. It was all the more important that he stand in front of the Roman people, show off his wounds, and announce that he would stand for liberty as long as he had life in him. But his brother-in-law didn’t have the stomach for it. He apologized, left, and barricaded himself inside his home. Cato, meanwhile, walked unguarded and alone to the polls. Fear can only enter the mind with our consent, Cato had been taught. Choose not to be afraid, and fear simply vanishes. To the untrained observer, Cato’s physical courage was reckless. But in fact, it was among the most practiced aspects of Cato’s self-presentation. And it was this long meditation on the absurdity of fear—on its near-total insignificance but for our own belief in it—that enabled him to press forward where others gave in.